The George Mason Memorial is an easy one to accidentally skip. It is just across the street from the Jefferson Memorial (i.e. south, Potomac side). It is not all that fancy, but it is a nice memorial. 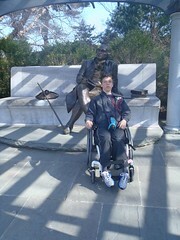 It is can be an especially fun one for pictures, as you can actually sit by the George Mason statue. Although getting right up to the statue is not accessible, you can still roll up close enough to touch George Mason's foot. Other than the step up to sit next to the statue the memorial is entirely flat, so you do not even have to deal with ramps at this one.